NEED, National English Education Debate that EDSA (English Department Student Association), has been held for the 6th times. This year, 20 teams representing English language education departments across Indonesia joined the competition. Starting with a technical meeting on 2nd January and the competition took place for three days, starting from January 3rd until 5th 2019. The first day is preliminary round 1 and 2, then the second day is preliminary round 2 and 4, the last day is for semi-final and grand finale. This event was held in Pasca Sarjana Building and was opened by the head of LPKA, Faris Al-Fadath, Ph.D. He hoped that the competition can foster open mindednes as participants can exchange mind through the competition. Mifta, the chief of NEED 2019 mentioned, “With this competition we hope can make millennial generation who they have great argument in nowadays issues”. In the grand finale, four teams, Universitas Negeri Malang, Universitas Muhammadiyah Malang, Universitas Negeri Jakarta, and Universitas Ahmad Dahlan met. 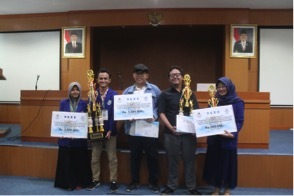 The first winner was Universitas Negeri Malang, and the runner up is was Universitas Negeri Jakarta. The best speaker award was awarded to a team member of Universitas Negeri Yogyakarta. This competition aims at developing students’ skill especially in speaking and to increase their critical thinking through debate. In addition, the competition also aims at strengthening the ties with other universities, and also to promote PBI UMY and UMY to the society.